We didn't start the Fire and perhaps neither should you. Amazon will enter the already crowded smartphone race on July 25th when it releases the Fire Phone. The Fire contains many features that intrigue mobile users. After reading these five reasons to avoid it, though, you will be less inclined to make the switch. The Amazon Fire is the exclusive property of AT&T when it releases this year. This means anyone in a contract with Verizon or T-Mobile will have to switch to AT&T. If you do not like AT&T's pricing or services, you are stuck with them if you want to buy the Fire. This cuts down the market for the phone because people with multiple phones (think family plans) with other providers will have to pay heavy fees to get out of their contracts. The Amazon Fire will have no official Google apps. The device uses the same Amazon app store as the Kindle tablets prominently feature. Yes, this digital store contains over 200,000 apps, but this number pales in comparison to the millions of apps featured on Google Play and the Apple stores. The Amazon Fire will have a 32GB and a 64GB model priced at $199.99 and $299.99 with a two-year contract, respectively; the phones will be $649 and $749 without their contracts. These prices were a shock to many pundits who believed that Amazon would try to undercut the market, like they did with its line of Kindle products. Why would you pay for an unproven new phone when Apple and Samsung have high quality phones already on the market? Buying a phone is a big decision for many people. With this in mind, locking yourself into a two-year contract with an unproven phone is risky. Amazon isn't the first big company to try its hand at making a phone. Ever hear of the HTC First or the ESPN MVP? Don't worry if you haven't, but that was Facebook's and ESPN's attempts at making phones that integrated their own features, and neither lasted on the market long. Fire features, while intriguing, will not appeal to the masses. Firefly is basically a price scanner for the Amazon website that will have people buying many things they may not need. The free year of Amazon Prime that comes with the phone is a nice addition, but if you already have a Prime account, it doesn't help you, and you still pay the same price for the phone. Finally, the Dynamic Perspective, which is a 3D effect built into the phone, has no real practical use, at least not yet. 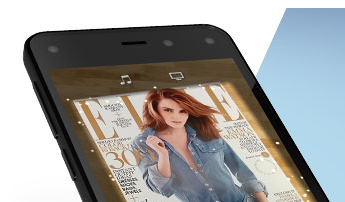 Amazon is a little late to the smartphone party. Samsung, Apple, HTC and many other companies have been making phones for a while, and had time to grow and polish their products. The Fire is heavier and thicker than other comparably priced phones. It also doesn't have an SD card slot or removable battery. When compared to the Galaxy S5, the Fire doesn't hold a candle to it in some aspects. The Fire has a 2.2GHz processor speed, while the Galaxy has 2.5GHz. The Fire screen size is .4 inches smaller than the Galaxy's screen. The Galaxy also has better screen resolution at 1920 x 1080 pixels, and a better rear camera at 16MP compared to the Fire's screen resolution of 1280 x 720 pixels and 13MP rear camera. The Amazon Fire also has the looming release of the iPhone 6 to contend with, which is rumored to occur in September of this year. The iPhone 6 is expected to increase its screen size to possibly 4.7 inches and maybe release a 5.5-inch model as well. Apple is rumored to give the iPhone 6 Sapphire crystal screens, in addition to a thinner design and a better A8 processing chip, along with a screen resolution of about 1704 x 960 pixels. Amazon will have a hard time getting the Fire to stand out with many quality phones out now and more released in the coming months.